It is a week before Christmas. If you are still feeling that finding that perfect gift for the gamer in your life is difficult, take a look at my 2012 Holiday Gift Guide's Part One and Part Two. This next game I will be reviewing was listed as a Nintendo 3DS game to get that special someone in your life. It's Style Savvy: Trendsetters. Let's get dressed for the occasion, shall we? A game about fashion-- no, that is not normally what you see reviewed here at SuperPhillip Central. Instead you normally see platformers, first-person shooters, role-playing games, and action titles. You might simply dismiss the subject of this review as shovelware, simply because of its content. 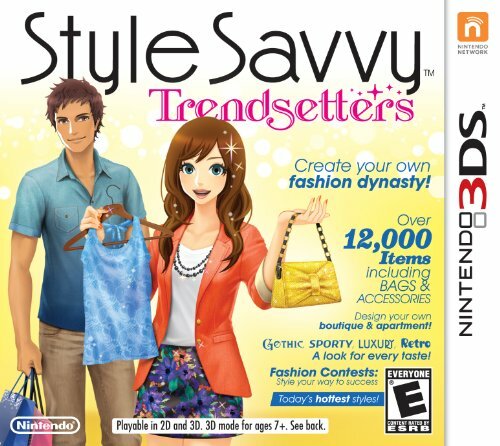 However, let it be known that such a position would be folly as Style Savvy: Trendsetters is one of the most from-out-of-nowhere-good games in the Nintendo 3DS library. Here's why. Style Savvy: Trendsetters begins with you being hired by Michaela, a heavily renowned fashion stylist with plenty of credentials under her belt. She teaches you the proverbial ropes of running a fashion boutique, pleasing customers, and taking care of inventory. Eventually, Michaela gives you ownership of the store, allowing you to name it whatever you want, refurbish the store (setting its look and music), fixing up the store's mannequin, and essentially lets you loose to do your own thing. with Michaela (on the right). As you become more famous in the fashion world by schmoozing with the locals and winning fashion contests (more on those later), the popularity of your store grows, giving you more customers. There are over 100 unique customers in Style Savvy: Trendsetters, and each one comes to you with their own tastes and what kind of style/piece of clothing they want. At first the requests from your customers are rather basic-- a pop-style skirt, an edgy jacket, and so on-- but as you get further into the game the customers ask you to create entire outfits based on their tastes, which you have to discern for yourself. buy on what you have in the store window. A new addition to this sequel of Style Savvy is the ability to dress men customers. Unfortunately, you cannot be a male character for your in-game avatar, which is disappointing. I understand it would have made a lot more work for the developers, so I cannot complain too much. Regardless, the amount of men clothing pieces and styles are far less than women pieces, but there is still plenty of pieces to look into and buy. Whether it is a male or female customer, whenever they buy something, their store card is stamped depending on how many items they purchased. The fun is to try to get your new customers to become repeat customers, buying more and more stuff for your shop funds to increase and for your customers to get more stamps on their cards. For the first time, men's fashion is available. Even though the task of finding the right fashion item for a customer may seem daunting, you are not entirely on your own. Style Savvy: Trendsetters makes coordinating outfits easy-- even for those of us without a tasteful eye for fashion. You can browse clothing pieces by type (dress, base, outerwear, shoes, etc. ), brand, taste (pop, preppy, bold, girly, luxury, etc. ), color, and price. It's a welcome feature of the game, and one that gives weaker fashionistas leeway to enjoy the game. When selling outfits and clothing pieces to customers, they get removed from your store's stock. This is where the Buyer Center comes in. The Buyer Center is where you go to stock up on the latest fashions from numerous brands, each with their own styles. At the beginning of the game, you are limited to holding a small amount of styles, meaning you can't just buy everything you see (your shop's meager funds will also make sure of that). However, the amount your shop can hold will increase as you play through the game. With that in mind, you still need to purchase a good mix of clothing styles to make sure you're ready for whatever your customers request. Also, anything you buy or receive clothing-wise goes to your closet for your character to strut around town in. Speaking of which, every busy working girl needs some time to herself. That is what My Apartment is for. You can sit down, unwind and relax, and do all kinds of activities. For one, you can advance time from day to night or night to day at your will. You are able to change clothes via your closet, dressing up in anything you have purchased or won. If you have any photos you have taken, you can use that photo to copy what you were wearing and wear it in the present. It's a very cool feature! Finally, you can redecorate your room-- change the wallpaper, flooring, and customize the furniture. Sometimes you just need time to relax. Another feature of the game-- this one can be accessed at virtually any time in the game-- is the cell phone. Here you can view pictures taken, look up fashion terms mentioned in the game, look at a fictional magazine for the hottest fashions and style news, take a glance at your schedule and any messages you may have received, glimpse over customers your boutique has served, see your profile card (which can be exchanged with others over StreetPass), and visit the Fashion Plaza, where you can open your own online store and view other players' stores. As you satisfy the requests of customers and perform other tasks in-game, your receive happiness. A gauge fills higher and higher with each positive action you partake in. As a game day ends, all of the happiness you have gathered fills up the moon in the starry sky. Fill it completely and you receive a bonus of some type. It may be a new store opening in town like the photo studio, the hair salon, the makeup studio, or the furniture store. It may be an increase in how much inventory you can store in your boutique, or it may be a new brand that comes to town. Accumulating happiness is an enjoyable activity, and you're always wanting to see what unlocks next in the game. You constantly have something to strive towards, which is very addicting. Places like the photo studio allow you to take three pictures of your in-game character in various poses against numerous backdrops. Show off your favorite outfits to your friends as every photo (either taken by you or done in the photo studio) can be saved to an SD card. In the hair salon and makeup studio, you predictably change your hairstyle/color/highlights and makeup respectively. Lastly, in the furniture store you can purchase items for your apartment to spruce things up a bit. One important feature that opens up as you gain happiness and progress through the game is the fashion contest. These contests are held nightly at the Contest Hall, and each one has a different theme. Each requires all four entrants to create an outfit based on a one sentence description. For instance, and this one is made up, "an edgy outfit with attitude." If your outfit is well coordinated and all pieces match together well, you will be the winner. There are multiple contests per fashion contest difficulty. Making your way through the Beginner Contests to the Premier Contests, and then finally beating the Elite Contest will give you top bragging rights, great prestige, and a view at the game's credits. Of course, there is definitely still plenty to do even after seeing the game's personnel as you and your friends strut on the catwalk. the competition gets more and more heated. Style Savvy: Trendsetters is full of content, and is easily worth the forty dollar asking price. From all the customers to please to the over 12,000 unique clothing items, your inner fashionista will be very enthused. Reaching the ending of the game took about twenty hours, and there was much more that I could accomplish with my save data. The game's presentation is certainly top-tier for the style of game it is. I've been so used to Imagine games from Ubisoft that I forgot that games of this genre could have remarkable production values. There is an Animal Crossing level of dialogue in Style Savvy: Trendsetters. It will take a long time to see a repeated line of text from customers. The visual design is well done. I like the anime aesthetic and how it doesn't overdo its own look. The graphics are colorful while not being too sugary sweet. The 3D effect is nice and has the text and characters popping out from the screen. Meanwhile, the music is quaint and serviceable for this type of game. I especially like the fashion contest theme that occurs as you're coordinating an outfit for your model of choice. Overall, Trendsetters really impresses presentation-wise. this girl is dressed for school success! But that's not all in how Style Savvy: Trendsetters impresses. From how complex the game is (but not too much so that it is inaccessible to beginner players) to all of the available customization, this 3DS version of Style Savvy is terrific. The game is a serious effort and well worth the money. It might become repetitive occasionally, but the good without a doubt outweighs the bad. Style Savvy: Trendsetters is definitely dressed for success. I am honestly surprised how much fun I had with the game, especially considering I am not the target demographic. Give Trendsetters a chance-- you might be surprised too.